Reminiscent of an episode during the Tour de France in 1904, the most difficult climb of today's stage fourteen, the Mur de Péguère, was riddled with tacks near the crest of the climb which caused a major disruption in the race. The Tour de France's race radio reported that many tacks had been found on the course. 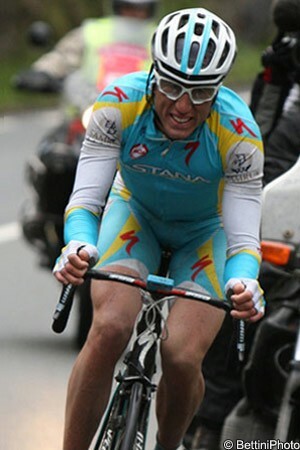 Astana's Robert Kiserlovski got the worst of the potentially deadly antics, as he crashed heavily over the crest of the mountain and has a reported broken collarbone. The only Croatian in the race had shown his good form just two stages ago, with a fifth place finish out of the breakaway on the course that traveled from Saint-Jean-de-Maurienne to Annonay-Davézieux. His injuries forced him to abandon the race, and he will be forced to wonder what could have been for his 2012 Tour campaign. Many more were victims of flat potentially crash-inducing flat tires. The ensuing drama also affected last year's winner, Cadel Evans (BMC Racing), as he reached the top of the climb with a flat rear tire. The Tour champion handled the situation calmly after teammate Tejay Van Garderen was unable to react for his captain amongst the confusion and frenzied crowds watching the stage. Amidst the chaos, the stage was punctuated by one of cycling's unwritten rules. Current race leader Bradley Wiggins and his Sky team decided to wait for the 2011 champion, trusting in their incredible performance thus far, and not wanting to taint their hard work with any doubts. Despite knowing the yellow jersey group had slowed to wait for the BMC Riders, Pierre Rolland (Europcar) chose to go out on the attack. Wiggins waved his hand in disgust at the Frenchman's questionable move, yet they continued to soft pedal as he rode off. Eventually Lotto-Belisol's position was threatened in the overall so they were reluctantly forced to ride, but it seems Europcar's director came to his senses and Rolland eventually sat up and was caught. Soon after an appreciative Evans and his chasing team waved at the team cars in thanks, and made it back to the group for an easy ride to the finish. We have a full version of the stage fourteen race report available. The situation in 1904 nearly saw the end of the Grande Boucle, but its stature in the sporting world today will see a much different outcome. It's not yet known what action the French police will take with regards to the attack on their biggest sporting event, but with the serious injury of Kiserlovski, the perpatrators could be in for more trouble than they had bargained. Tacks and the fast mountain descents of the Tour de France combined to be a potent recipe for disaster.